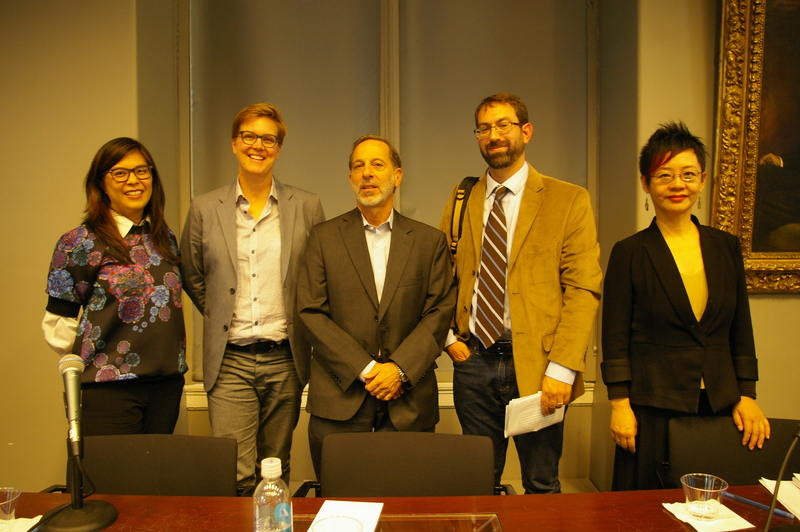 Photographs, audio, and video are now available from the October 8, 2014 event “Around 1948: Human Rights and Global Transformation.” The event featured Rashid Khalidi, Edward Said Professor of Modern Arab Studies, Columbia University; Lydia H. Liu, Wun Tsun Tam Professor in the Humanities, Columbia University; Samuel Moyn, Professor of Law and History, Harvard University; and Deborah Nelson, Associate Professor of English, University of Chicago. 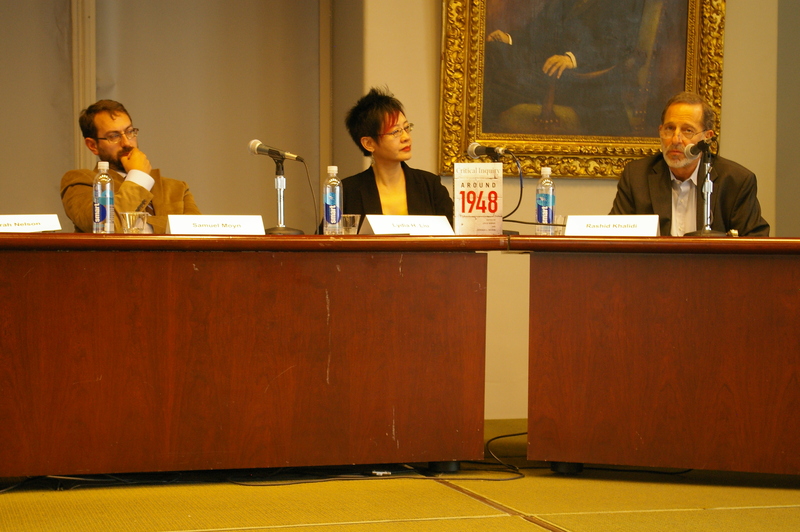 Their discussion was moderated by Eugenia Lean, Director of the Weatherhead East Asian Institute and Associate Professor of Chinese History, Columbia University. 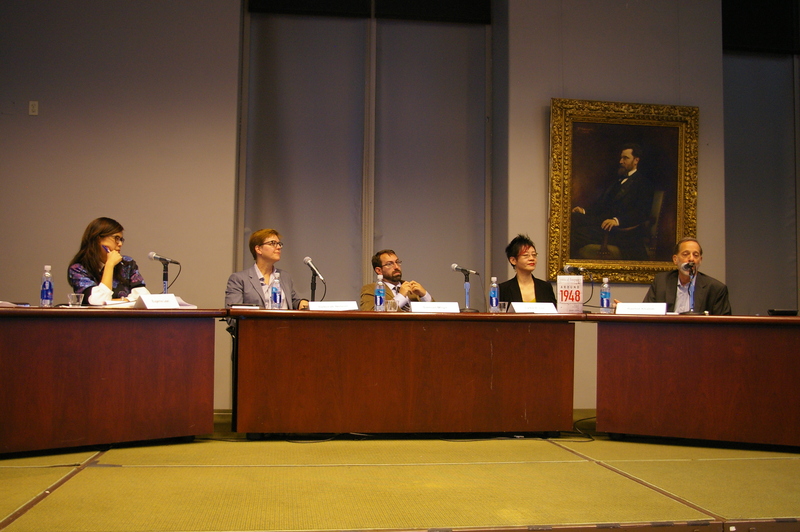 During the event, these scholars discussed the advent and the global impact of the 1948 Universal Declaration of Human Rights. 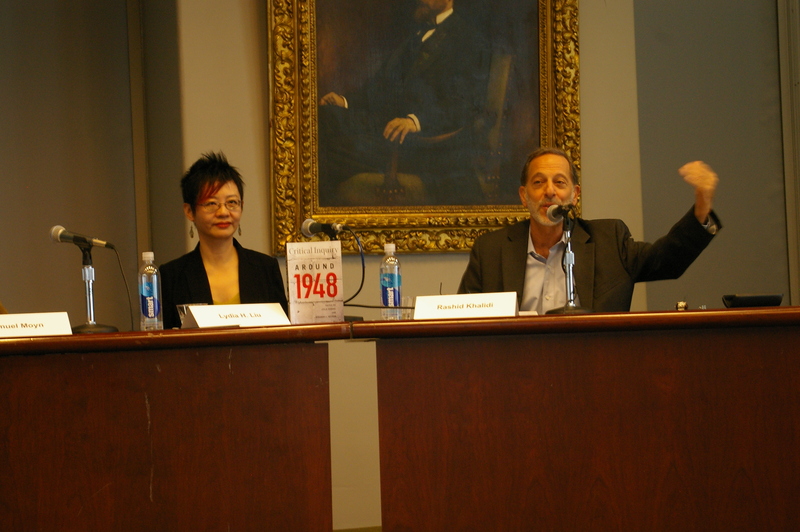 Professors Khalidi, Liu, and Moyn wrote essays surrounding these issues in the Summer 2014 volume of Critical Inquiry titled Around 1948, which Professor Nelson edited with Brown University professor Leela Ghandi. 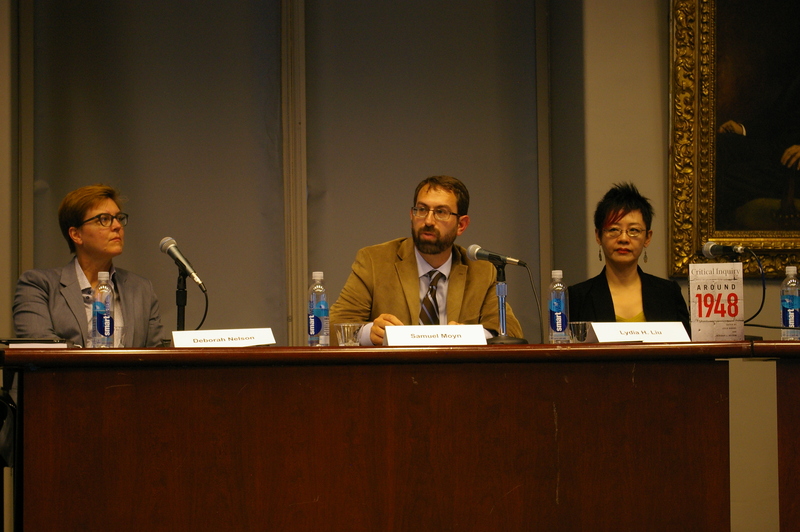 To read an extended interview with Professor Liu about her essay on human rights pioneer P.C. Chang, please click here. 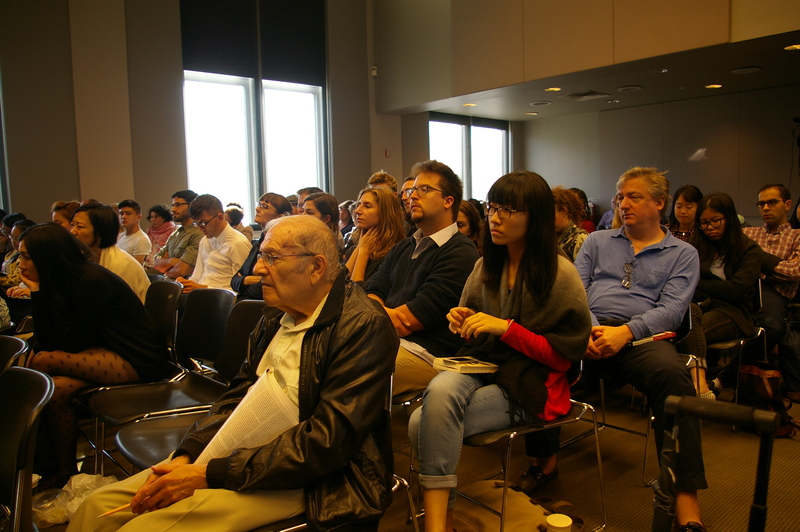 The event was co-sponsored by the Center for International History, Critical Inquiry, the Department of East Asian Languages and Cultures, the Department of History, the Institute for Comparative Literature and Society, and the Middle East Institute. 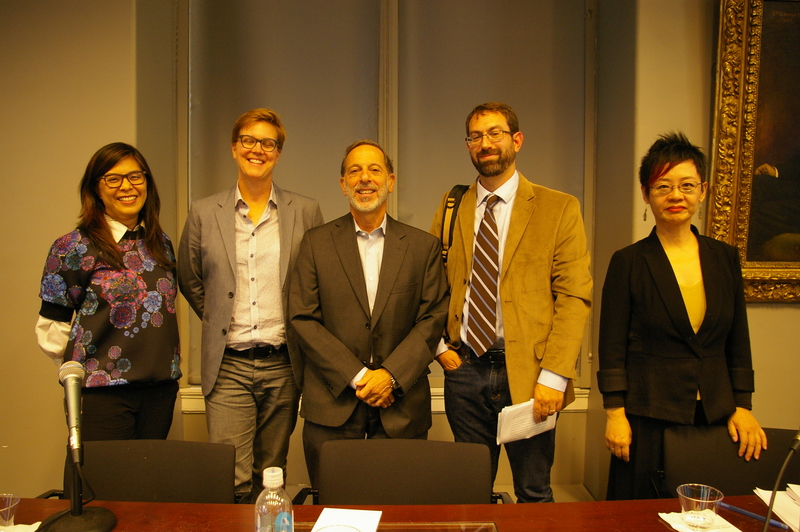 “Around 1948” is part of the Weatherhead East Asian Institute’s Human Rights in East Asia and Beyond: Critical Perspectives series, a year-long critical examination of the issue of human rights which includes lectures and panel discussions. 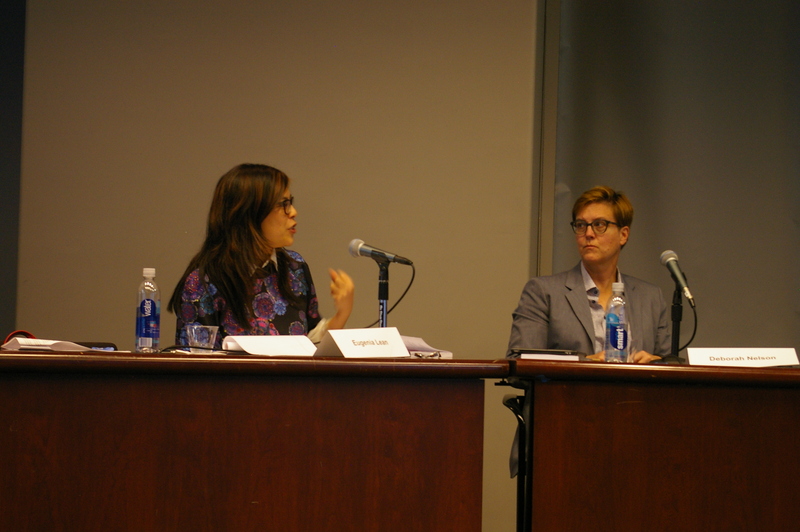 The next event in the series is “The North Korean Human Rights Conundrum” on Nov. 6, 2014. 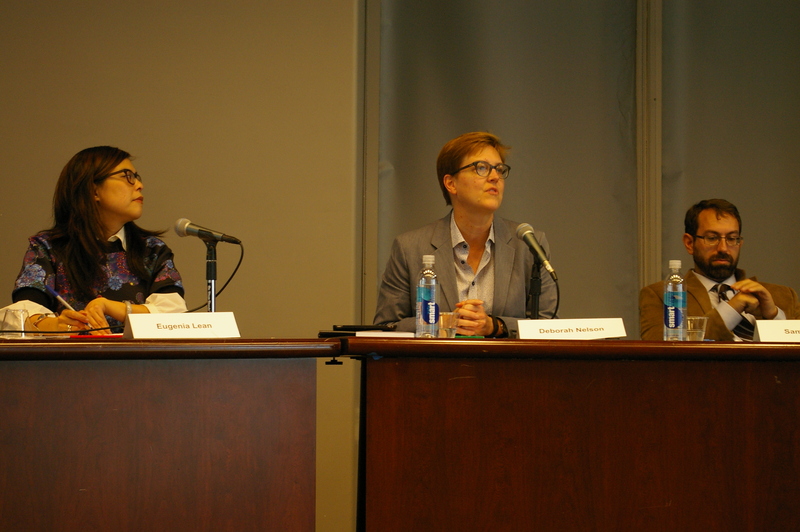 For audio of the event on iTunes, please click here. Columbia University‘s list of illustrious alumni includes many graduates from China whose achievements have been widely celebrated. Columbia alumnus Peng-chun “P.C.” Chang (1892-1957), the Vice-Chair of the United Nations Commission on Human Rights and one of the architects of the Universal Declaration of Human Rights, has received relatively less recognition–until now. 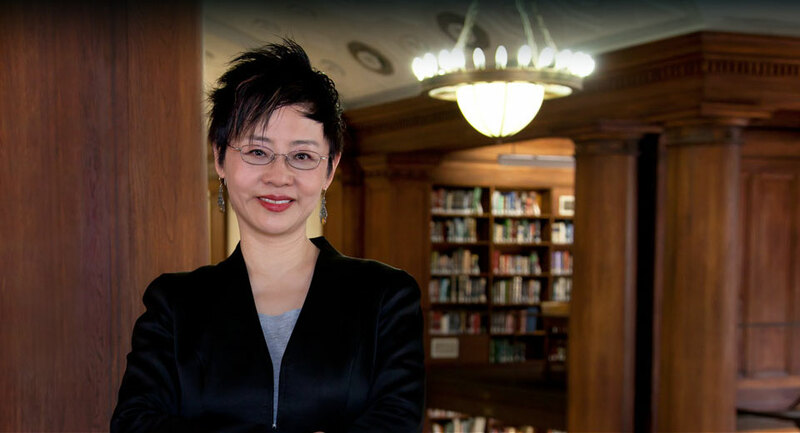 Lydia H. Liu, the Wun Tsun Tam Professor of the Humanities at Columbia and a faculty member of the Weatherhead East Asian Institute, has published an article in the Summer 2014 Critical Inquiry titled “Shadows of Universalism: The Untold Story of Human Rights around 1948” that sheds light on P.C. Chang’s central role in drafting the Universal Declaration of Human Rights. Chang was instrumental in the creation and passage of the 1948 declaration and the later International Bill of Human Rights, documents that helped define human rights and that included all people regardless of their nationality. Professor Liu talked with the Weatherhead East Asian Institute about her new article (available here) and why Chang’s importance in the history of human rights has yet to be given its due. Who was Peng-chun “P.C.” Chang? P.C. Chang was not actually a career diplomat. He was a literary scholar, a playwright, and a poet. He received both his master’s and doctoral degrees at Columbia in the Teachers College. People say he studied with John Dewey; a lot of Chinese students who came to Columbia in the 1920s and 1930s said that they worked with Dewey. Of course, they took classes with lots of professors. The detail about Dewey we don’t know. P.C. Chang’s education had nothing to do with diplomacy or international relations. He was studying literature in the 1920s. This is right in the period that I have studied for a long time. He was a founding member of this literary association in the 1920s called the Crescent Moon Society, which consisted mostly of students who came back from English-speaking countries—mostly the United States and England—where they had been educated. The Society published a literary journal. 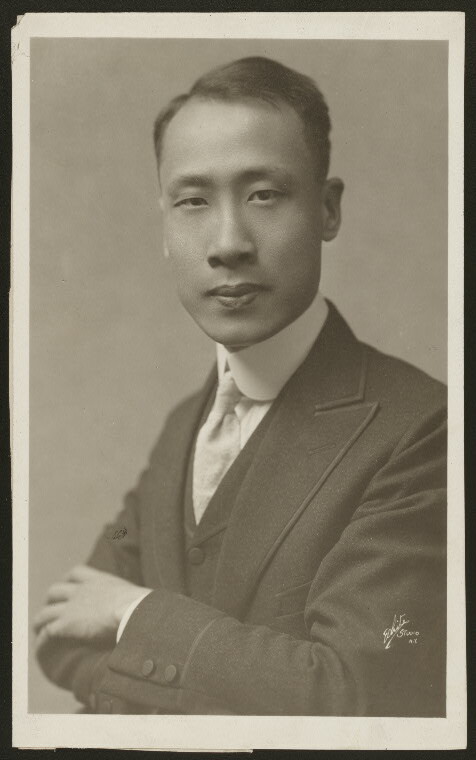 Chang was also the person who introduced and interpreted Mei Lanfang, the Chinese opera singer who visited the United States. Chang was very active and he produced a number of plays for Broadway when he was a student. He produced the play “Mulan” in the 1920s in New York. We now think of Maxine Hong Kingston’s rewriting of Mulan in The Woman Warrior and the 1998 Disney film version. With Chang, we’re looking at someone whose education and upbringing probably would not take him in the direction that he would take when he became the Vice-Chair of the Human Rights Commission, which was tasked for the drafting of the Universal Declaration of Human Rights. What was Chang’s path to the United Nations? It’s quite interesting: a person’s life will take unexpected turns often at the mercy of the times. For instance, Chang received his degree from Columbia and he then went back to China to teach. He briefly served as an administrator at Tsinghua University, where I run my center. He was basically an educator, a teacher, and also a drama reformer. He taught Cao Yu, who is now considered the twentieth century playwright of China. Some of Cao Yu’s plays have become classics in modern Chinese literature. Chang was doing all of these things: introducing reforms in Chinese opera; editing; encouraging new literature; participating in interesting enlightenment reforms in China. This was all until the Japanese attacked in 1937. I should note that P.C. Chang’s brother, Chang Po-ling, (1876-1951) had founded Nankai School in Tianjin—which is now Nankai University. Chang Po-ling was known for his pedagogical emphasis on sports, and when China was granted the privilege of hosting the 2008 Olympics, his name was everywhere in the media. Chang Po-ling was credited for introducing modern sports to China–a thing of national importance. P.C. Chang came from a background very closely associated with university education. But when the Japanese attacked Northern China, they bombed Nankai University. A lot of intellectuals and university educators went into exile. Many went to the south. The professors had to decide whether to move south or serve under the puppet government under colonial occupation. Chang chose to leave—he lost the university. As it turned out, these English-speaking, American-educated Chinese educators could go abroad and organize campaigns against the Japanese aggression. It was the anti-war efforts mounted by the nationalist government that drew P.C. Chang into this campaign. He travelled around to raise funds and raise consciousness about Japanese attacks against China. This was way before the United States became involved in World War II. He was an eloquent speaker, a very passionate intellectual—erudite and learned. He was thoroughly bilingual and bicultural. China’s government thought he was very useful. The Ministry of Foreign Affairs appointed him to a post in a neutral country, Turkey, during World War II. He served in the embassy in Istanbul for some time before he was dispatched shortly before the end of the war to Chile, which was another neutral country, to serve as the Ambassador of the Republic of China. After that, the Allies were preparing for the founding of the United Nations. P.C. 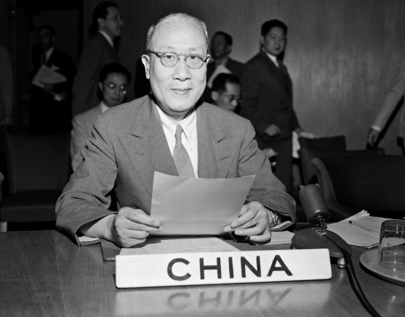 Chang was selected by his government to represent China to the United Nations and became one of the early founders of the U.N. This was all by accident: a senior diplomat couldn’t come for some reason, and Chang was asked to go from Chile to San Francisco to help found the U.N. He then became a very vocal and prominent figure in the organization’s early days. 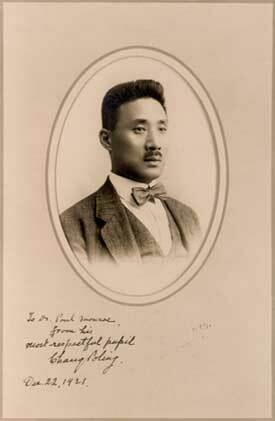 Chang was active in the Economic and Social Council, under which they organized the Human Rights Commission. Because of his prominence at the U.N., Chang was elected to be Vice-Chair of the Human Rights Commission. Eleanor Roosevelt was the chair. The two of them worked very closely together. I looked into Chang’s work not just because of his fascinating biography but to rethink some issues connected with how we even talk about human rights. Why is Chang’s role in the history of human rights less known? I’ve been wondering about that. One of my colleagues said “I’ve been teaching human rights for so long but, somehow, I’ve never come across his name.” That’s the question I had when I started the research: how come the memory was erased of someone who was such an important player in the drafting of such an important universal document? You might attribute it to a few factors. I think, number one, most people think of “human rights” as a Western idea. Many people can’t contemplate that after World War II–especially through the mediation of the Human Rights Commission and the drafting of the Universal Declaration– the idea of human rights had already been transformed by many non-Western cultures and histories. Chang was one of the most important figures in that mediation, but there were other non-Western nations that were represented. The first factor is that people simply have this knee-jerk reaction when you talk about human rights: “Oh, it’s a Western idea. You can trace human rights back to some European theological notions of natural rights.” That’s probably the most central factor. How do you get around this mental block that “this is Western and that is not-Western?” How do you get around this proprietary genealogy of ideas? People do claim ideas, saying: “I own this idea. You take this idea from me and I influence you.” That’s the usual way of thinking about ideas. It’s curious how people take possession of ideas. If you tell them that “perhaps you don’t possess this idea,” they will probably panic. We’ll see if people panic. It’s not as if people have not already discussed P.C. Chang’s contribution; a number of human rights scholars, especially historians, have pointed out his work. I’ve mentioned them in my footnotes. It is not that he’s entirely forgotten. But, still, that information about P.C. Chang’s role on the Human Rights Commission would not change the deeply rooted idea that the West possesses the idea of human rights. It’s especially true if the idea is a good one—you don’t let other people take it over: “it’s my idea, not your idea!” I’ve done a lot of work in the past on the possibility of approaching ideas through translingual practices. I’m very curious about the meeting of minds and the circulation of ideas. I want to see if there’s a way to get around the mental block of “I own this; you own that” and the policing of boundaries—usually linguistic boundaries—and to free ourselves of all these inherited ways of possessing ideas and then see what happens. It was an experiment for me, methodologically, to not just bring P.C. Chang to light, but also to make most people see the history that he helped fashion. It’s not just the document—the Universal Declaration of Human Rights—that’s important, but also Chang’s participation in various debates as one of the third-world intellectuals. In the United Nations, P.C. Chang argued strongly against what is called the “classical standard of civilization”—a standard in which certain nations or peoples are considered “civilized” or “uncivilized” and the “uncivilized” are excluded from international organizations and laws. My central problem in writing this article was to look at the moment when the classical standard of civilization first confronted human rights discourse. This is not how people usually look at human rights. I spent some time in this essay explaining what the classical standard of civilization is; a lot of current international relations protocols still preserve the classical standard of civilization. For instance, international law is practiced by “civilized nations.” That very expression excludes some other nations. You begin to ask: where did this standard come from? This rule of law, when it’s practiced among nations, would then stipulate that certain people would be excluded—not because they don’t practice the rule of law but because they belong to the lower strata of stages of society. These usually colonized people are what international law would define as “non-self-governing people.” The idea is: “Can people govern themselves? If not, we will go and govern them.” This is the second factor in why P.C. Chang’s contribution has been erased. In the articulation of the universalism of human rights, I wanted to emphasize the “shadows of universalism.” The classical standard of civilization belongs to the shadows of universalism. The universalism sets certain parameters as to how far any good universal idea could be applied. Certain people are excluded. To see this, I focused on one of the central debates in 1950 at Lake Success in New York. You note that many scholars examine history by looking at the words people had used. 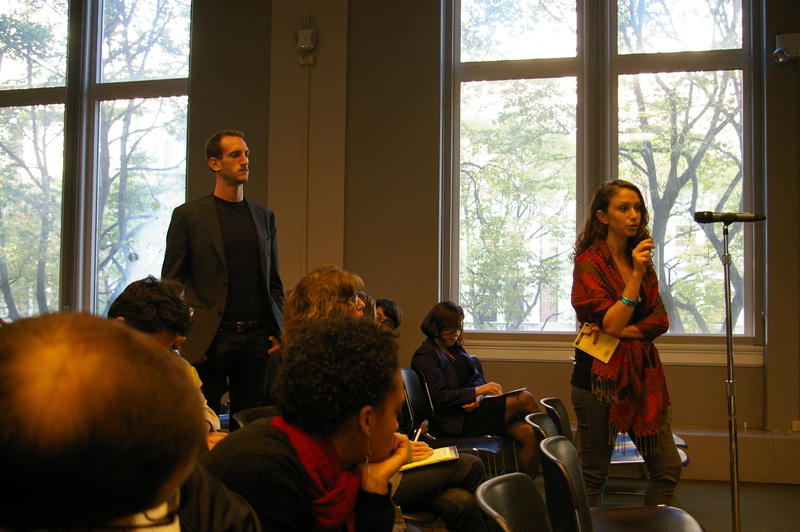 Can you explain your approach in looking at “shadows” in the debates over human rights? Most scholars in the humanities, social sciences, and sciences—they take words as a sort of focus when they want to analyze ideas. Intellectual history often does this. I am often skeptical of this equation between words and concepts. Verbal fetishism gives people the illusion that words are stable and self-evident. To the extent that they exist, they are more or less stable and prominent, especially in print as opposed to speech. Words are discrete and repeatable. You can focus on them. They can be mobilized as evidence. Whether you argue about the continuity or the discontinuity of ideas, you focus on words. Words are seen as positive evidence. But, once you begin to ask questions about gaps and silences and repressions that do not appear as positive signs—which words often stand for—what would you do? How do these shadows that exist in silences, gaps, and repressions determine or govern how the positive signs—words—operate? I wanted to ask these questions. Once you ask these questions—for instance, when people discuss human rights and its genealogy and history, they don’t pay attention to the classical standard of civilization. But, when you look at the debates—especially in 1950 on the floor of the General Assembly—you see how the classical standard of civilization structured some members’ understandings of human rights and how this relationship was brought into the open in the debate and how people like Chang contested that. Can you discuss the presence of those shadows in the 1950 contestation over the addition of “self-determination” as a human right–which Chang supported–in Article One of the International Covenant on Economic, Social and Cultural Rights? For a long time, scholars of human rights complained that when “self-determination” was written into the International Bill of Human Rights, this was an unfortunate event. They believed that human rights simply meant the political and civil rights of individuals. The individual is often taken as the unit. And they take that story of the individual all the way to European natural rights theory. They view this strange insertion of “self-determination” as a human right as a distortion, as a misunderstanding, as a mistake. I take issue with that. I think that if they studied the 1950 discussion among member states of the United Nations, they will see that the countries that insisted on writing “self-determination” into human rights were not the ones who initiated this. What happened was, in October 1950, the General Assembly started to debate the covenants of the International Bill of Rights and representatives of Belgium, France, England, and the U.S. supported adding a special clause to exclude non-self-governing people or colonial people from the application of human rights. This came as a surprise to people who had, two years before, approved the Universal Declaration of Human Rights. That document, passed in 1948, was a moral document, not a legally binding document. These colonial powers were concerned that the automatic application of the Universal Declaration would empower the colonized people, then they would also demand universal human rights. It made sense for them to propose a clause because their governments didn’t want to see trouble in their colonial territories. The clause alleged that the colonized people had not reached the high standard of civilization. This is the language of the classical standard of civilization saying that these people should not be automatically included in the covenant and that they must acquire sufficient progress to be considered entitled to human rights. This came as a surprise. I looked through the minutes—what they call the Summary Reports—of the General Assembly and read fascinating debates back and forth about whether colonized people and non-self-governing people should be entitled to human rights. The document they passed two years before would have entitled them—regardless of their stages of progress—but the colonial powers wanted to block that. All of sudden, the colonial powers advanced an argument of cultural relativism: “they are different from us and they are inferior to us, so they should not be included. “ All of a sudden, their universalism became cultural relativism. I was fascinated by how universalism and cultural relativism became the battleground between those nations that had colonial possessions and those that either were newly independent nations or those that were not colonial powers. It’s fascinating to see how their opposition was defined by this encounter between the classical standard of civilization and the universalism of human rights—a very new universalism. How did P.C. Chang introduce and translate Chinese or Confucian concepts through his contributions to the Commission? It’s very interesting how P.C. Chang tried to revise the meaning of “human” in human rights. 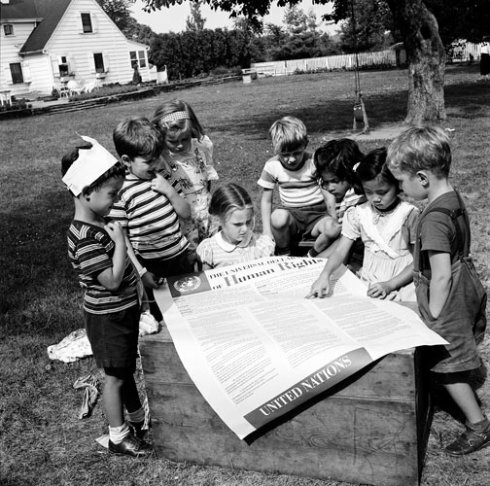 There were many drafts and discussions about the Universal Declaration of Human Rights. I compared the Geneva draft and the Cassin draft and several other drafts. In the example of Article One of the Universal Declaration of Human Rights that I use to show the intellectual intervention P.C. Chang wanted to make. There are philosophical implications in his intervention—I wanted to insist on that. I’m not the first one to point out that P.C. Chang wanted to bring Confucianism into the Universal Declaration of Human Rights. I wanted to point out that whatever Chang tried to do, in appealing to a Confucian concept, it happened on precarious intellectual ground. His colleagues didn’t understand what he was trying to do. A very good example is this concept of “ren,” which is written with the Chinese radical for human and for the number two. Article One of the Universal Declaration of Human Rights ended up stating: “All men are born free and equal in dignity and rights. They are endowed with dignity and conscience and should regard each other in the spirit of brotherhood.” That’s the approved version. But, in some of the earlier versions there was no mention of “conscience.” They were simply endowed with “reason.” Chang had suggested that perhaps that reason alone was not adequate. He then suggested that Article One include another concept—“ren”—that, next to reason, is also an essential human attribute. Human beings are endowed not just with reason but with something else. What is this something else? Chang came up with a literal translation of a concept from Confucian moral philosophy which he calls “two-men-mindedness.” When you write it out, it’s that Chinese character pronounced as “ren” but that can be glossed as “two-men-mindedness.” It’s kind of awkward—no one understood Chang. So, he said it’s like sympathy—conscience for other people. He couldn’t quite find an equivalent because there was no equivalent in English or French that would help his colleagues understand what he was going after. They decided that they would translate it as “conscience,” which is kind of misleading. If you go back to the archival material, you begin to understand why it was a precarious move. Chang tried to introduce one idea but it was substituted by another idea. I wanted to point it out because I wanted to show how he tried to philosophically revise the notion of “human.” I translate “ren” as the plural human, not literally as “two-men-mindedness.” The human radical is not about men, it’s not gendered. I show that the plural human is not just a Confucian idea; it’s also a twentieth century intellectual engagement with a Confucian idea. Intellectuals tried to change the definition of human in the larger international context in the 1920s and 1930s when there was this discussion of political pluralism in political theory. Confucianism was part of that discussion. Chang was simply bringing that intellectual tradition into the discussion of Article One. We can’t just conclude that this is a Confucian idea; it’s a Confucian idea that was in the process of being refashioned in the twentieth century by a lot of intellectuals. I pointed out that German philosopher Carl Schmitt’s The Concept of the Political had a footnote that refers to the Fabian society group who tried to promote a liberal concept of political pluralism. One of the theorists in that group was from China—this was in the 1920s. Chang’s Crescent Moon Society journal was very much involved in the human rights and civil rights debates when they criticized the nationalist government. Human rights activists were arrested by the Guomindang for engaging in this kind of criticism. So, human rights had already been part of the political reality and practices in China before World War II. Scholars have studied this but I wanted to bring in this connection with the nature of the philosophical work that P.C. Chang was trying to bring to the conversation. It’s very complicated. In the early 1930s, human rights and civil rights discourse in China was primarily targeting fascism. The Guomindang government was perceived as a fascist. So, you see, we have a twentieth century international scenario which led to the ways in which P.C. Chang made his intervention—political and philosophical—in the drafting of the document. What became of P.C. Chang after his time in the United Nations? It’s really unfortunate. P.C. Chang died in 1957 of a heart attack. He lived on the East Coast in New Jersey. He had retired from the U.N. What’s so tragic about his career was that the nationalist Chinese government and the Communists engaged in a civil war while he was serving in the United Nations– especially at the time when he was closely engaged in the covenants of the International Bill of Human Rights. When historians emphasize his role, I think they’re right in pointing out that P.C. Chang himself played a very important role. Normally, delegates from some countries would have to telegraph their governments about their position before they make a proposal. This was the norm. Even in the Human Rights Commission, the Soviet delegate, the British delegate, the French delegate would all have to follow the orders of their governments. But Chang was an exception. Why? Because his government was in disarray. He would send telegraphs asking for instructions and he would receive none. It was just the circumstances that gave him a lot of freedom. He made almost all of these interventions on the Human Rights Commission on his own initiative because his government ignored him. And, what’s so tragic about him is that his government—the government that sent him to the United Nations—lost China; they moved to Taiwan. He didn’t go back to Taiwan. He simply stayed. You see how torn he was. Unfortunately, there are not many surviving testimonies as to how he viewed the civil war in China and how he made the decision to stay in the United States. There’s only one volume of collected documents of his speeches at the U.N. and some of his early works. We have very little information about that crucial period of time about how he reacted when the civil war in China broke out. He was cut off, essentially, from communication with his government; he was essentially an open-minded liberal, probably left-leaning. His government was right-wing and it was determined to exterminate the Communists. You can see how torn he was. The only possible trace I could get was from the diaries of John Peters Humphrey, a distinguished lawyer from Canada who was in charge of the Secretary of the Human Rights Commission. Humphrey left behind a detailed diary of what happened. I consulted the diary and the entries near the time after the civil war in China broke out suggested that Chang was often in a bad mood and was not his normal self. Chang would lose his temper; before, he was an excellent, smart negotiator who could deal with people’s difference and make them cooperate together. After the civil war in China, he became a different person. You could sort of tell from Humphrey’s diary that the rapidly changing circumstances must have taken a toll on Chang’s psychological state. Chang died just a few years after he retired from the United Nations. Chang is not usually thought of as one of Columbia’s most distinguished Chinese alums. If you’re not interested in human rights, you don’t hear about him. As a Columbia alumnus, he actually made more of a contribution than some of the other well-known Chinese graduates. A lot of other alums are mentioned for shaping history, especially Wellington Koo, who had a long life and international career, or, Hu Shih, who played a role in China’s May Fourth Movement, and Feng Youlan, who created the modern discipline of philosophy in China. We look at these famous intellectuals who are Columbia alums. You don’t think of P.C. Chang at all. The Universal Declaration of Human Rights has had far reaching impact around the world. He was a major player and so, in the long run, he should be more remembered than any of those people for the very interesting interventions he made. I put him above all of these people in terms of his learning, in terms of his political vision, his determination to create something that people in his time could not even imagine creating: that is a truly universal world. Not turning human rights into another standard of civilization—saying “We have human rights; you don’t have it”—but, rather, something else. I think P.C. Chang is a Columbia alumnus that people should pay attention to. 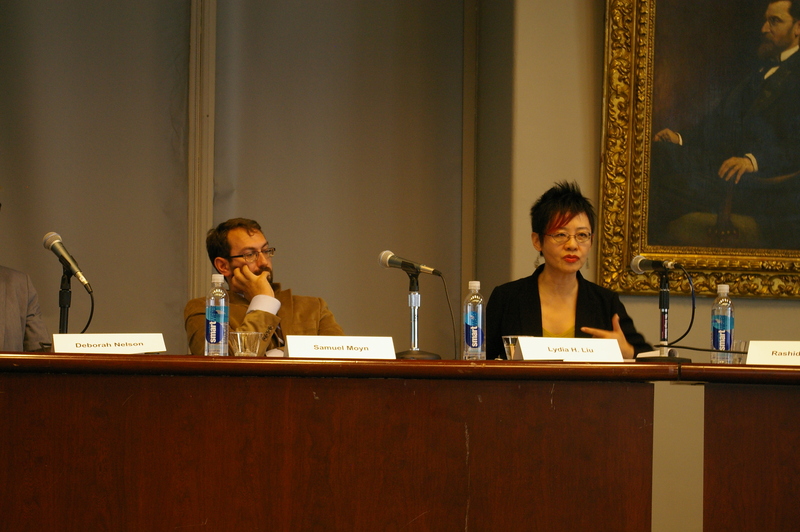 Lydia H. Liu is Wun Tsun Tam Professor in the Humanities at Columbia University. Her publications include The Freudian Robot: Digital Media and the Future of the Unconscious (University of Chicago Press, 2010); The Clash of Empires: The Invention of China in Modern World Making (Harvard University Press, 2006); and, as co-editor, The Birth of Chinese Feminism: Essential Texts in Transnational Theory (Columbia University Press, 2013).